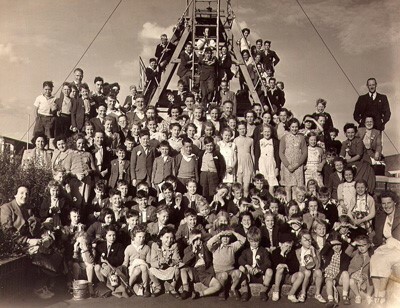 When the children of Bishopthorpe posed for the camera during a day trip to Filey in 1949, little did they know that, 57 years later, their captured image would be reproduced within a community archive project. Bishopthorpe Local History Group was awarded £5,000 from the Awards for All (Lottery) scheme to set up a Community Multimedia Archive. The money enabled the Group to buy a computer, scanner and software to record photographs of Bishopthorpe people, buildings and events. Oral reminiscences can also be included as well as cine and video footage and other memorabilia. The aim is to present an archive created by the people who live in the community. The result will eventually be published on a CDROM. The software we use is called COMMA (Community Multimedia Archive). It was originally created by a Leeds co-operative called Storyville and first used by the Batley Community Archive in 1995. Since then, many groups have built up similar archives in towns and villages throughout the UK and abroad including, more locally, at Poppleton and Tang Hall. The equipment is housed at Bishopthorpe Library in Main Street. We have been working on the archive for some time and currently have about 1,200 photographs. They range from the late 19th century to the year 2000. How does it work? Once the material is scanned into the computer, it is catalogued and indexed thus making it easily searched by topic, name of person, place, location and date. For example, searching an event such as the Bishopthorpe pageant will produce photographs and programmes dating from 1930 to 2000. A local person can be followed through from childhood to adulthood and can even be identified within a group using a system called ‘hot-spotting’. Photographs of buildings and streets reveal the growth and change in the village. Creating a collection in this way reflects our cultural heritage and preserves village history for future generations. We will continue publishing photographs from the archive on these pages. We always need help in identifying the people, places and events in photographs like the one illustrated. The stories and memories which lie behind them are also of great interest and can be included in the ‘reminiscence’ sections. In fact, we are interested in any Bishopthorpe-related material for the archive; not only photographs and slides, but also documents, newspaper articles and leaflets. Linda Haywood, 39 Acaster Lane, Bishopthorpe, York YO23 2SA.